Unit 211 at 478 King St. in Toronto was sold for a high return on investment within 19 days, via Design to Impress’ condo staging. When you choose to sell your condo, think of it as a product. You need to detach yourself from your home to get it sold quickly. Our condo staging team knows how to turn houses and condos in Toronto into products that sell for a high ROI, and did so with unit 11 at 478 King St. West, a condo in Downtown Toronto. Some rooms were painted the same colour in order to make the area as a whole seem larger. The unit’s tiny kitchen and dining room had a seamless look as a result. In bedrooms, walls were painted the exact same colour as the drapery, also to alter the size perception. In narrow spaces, ledges and shelving were installed to add depth, specifically by painting the areas behind the shelving. Luxury linens and soft neutral colours were used in bedrooms to create an intimate ambiance. Stainless steel appliances were cleaned on the inside and out. Residue was removed from ovens, fingerprints removed from the refrigerator, and the areas around such large appliances were thoroughly cleaned. Countertops were purged to only contain a bowl of fruit and fresh flowers, making the space larger, while adding natural colour to the kitchen. Cracked bathroom tiles were replaced, mold was removed and grout was stained. No one wants to see a dirty bathroom, and even the slightest imperfection can lower the asking price. Medicine cabinets were cleaned out and repainted. Bathroom cabinets are always looked at by potential buyers looking for space. 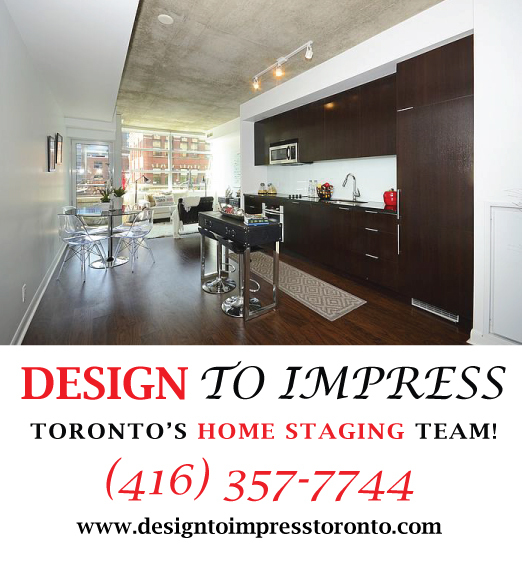 The house at 169 Rhodes Ave. in Toronto was staged to sell for a high ROI and sold in than 19 days, via Design to Impress, Toronto’s home staging company. 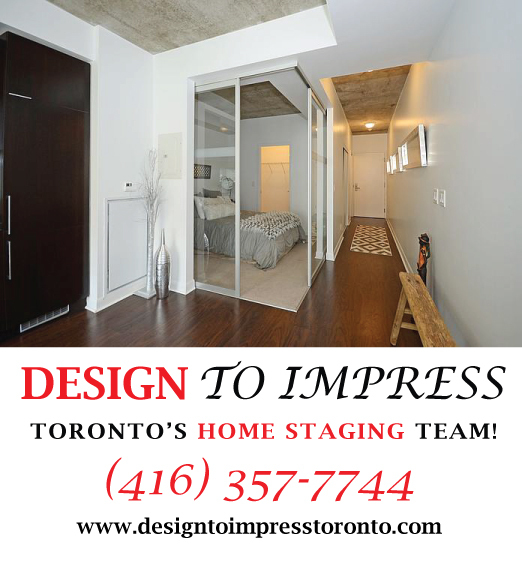 112 Courcelette, Scarborough home staging, house staged to sell for a high ROI via Toronto’s house stagers, Design to Impress!